Hello All! It’s been a pretty crazy past few weeks with a never-ending to do list in my hands…internship applications, studying for finals, apartment shopping, blog editing. I was lucky to have time to put on a face mask and relax for 20 minutes last week. (apologies to my skin!) But hey, you get what you put in and working hard always pays off at some point. I put together some of the things that help me get through the madness everyday! 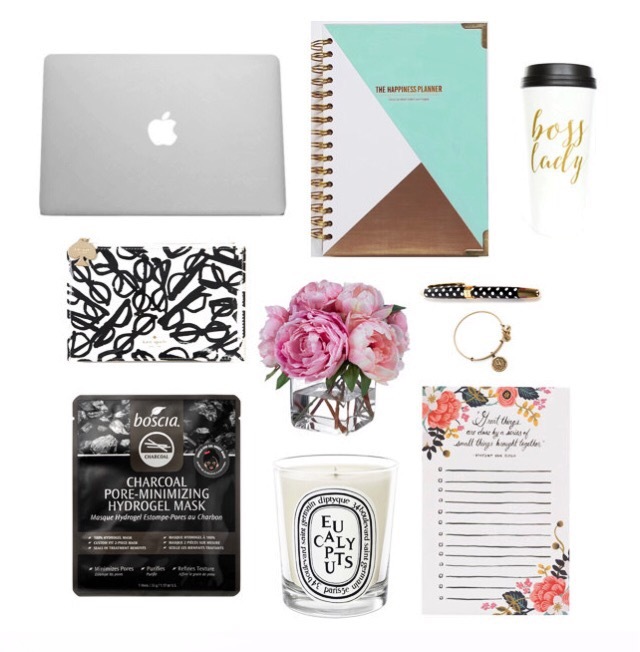 These are my #girlboss necessities! What are some of yours?! To organize everything from school to music to this blog! I definitely recommend the air because it’s so light and easy to carry around. It’ll easily fit into a tote or backpack. And… not to mention this is the 5th generation Macbook Air and has AMAZING features including the most important of all- 12 HOUR BATTERY LIFE. This seriously saves me. I can take this thing anywhere and never have to worry about finding an outlet. I cannot emphasize this one enough! My planner is like my personal assistant and motivator. It helps me get all my priorities in order, and allows me to set goals/deadlines which is so important! Get a planner that fits two things: your needs, and your personality! Thermal mugs are a must for on-the-go days, (gotta avoid those spill struggles in the car!) You can find, and personalize super cute thermals from Etsy.com! This mug helps me get through the day with all my coffee and tea refills like a #bosslady! Having flowers around my workplace in the house is really helpful to me. It brightens the room + my mood so much, and I actually notice a difference! I try to get peonies as much as possible because they are my favorite flower and smell so nice! Tulips, sunflowers, and hydrangeas are also some other favorites! This calls for a DIY arrangement, just add blooms and burlap! Sometimes when the days get busy, it gets hectic and is hard to accessorize. Because of this, I like to wear my “J” initial Alex & Ani bangle daily. It’s a must-have everyday accessory because it’s so minimal, trendy, and personalized. It represents me and that’s a huge reason why I love it so much! You can still have a busy schedule & have arm candy. One of the best pieces of advice that I can enlighten you with is that even in the most craziest of times with tons of deadlines and things going on, MAKE TIME FOR YOURSELF. Those one or two hours of relaxing isn’t time wasted, because it will help you in the long run of your week. I usually pick one or two days of the week to do a face mask, lay down and listen to some relaxing music, close my eyes, and clear my head + skin. Out of all the great masks out there (definitely need to do a “top 10” mask post for you guys!) this one does it all! The charcoal really clarifies your pores, while the hydrogel is moisturizing your skin, and the texture of your skin becomes dewey and glowy! Besides having a planner, a daily to-do list is super helpful. I like to organize the days’ to-do’s in order from most important to least. Mine is from Rifle Paper Co. and they have a good variety of notepads with really cute designs! They even have market lists, and other specific lists if your a list person! I hope you all enjoyed this collage I put together, and my tips on #girlboss necessities! If you guys have any other tips and secrets, I’d love to hear it in the comments below! I’m interested in all of your #girlboss needs! Have a wonderful rest of the weekend, and happy Girlboss-ing! Thank you so much, and i definitely will! thanks! Thank you so much! Yes it’s so nice and worth it! I have that same to-do list! I love the floral design and the quote. It’s almost too pretty to write on. Love print on thr planner! Can’t wait for next post!! Exciting stuff, especially the pencil bag and the planner!!! Obsessed with your page layout, it’s beautiful!! Also love that you still use a planner, I feel like that’s so rare now a days! I have to have my planner and pencil pouch at all times. I have several Alex & Ani bracelets and I love them. I also can’t live without note pads. If I don’t right it down, I forget it. I love sheet masks too. I put mine in the refrigerator a few minutes before I use it. It’s a great trick!